Stock quotes show you the willingness to buy and sell in a market. A Bid (or buying) price represents the willingness for a buyer to purchase stock at that price. The Ask (or selling) price represents the willingness of a seller to sell shares of stock at that price. 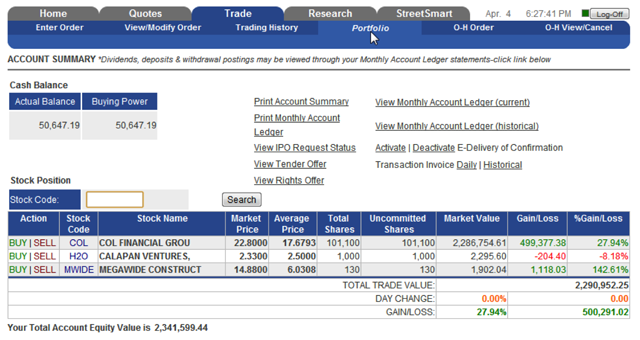 The size columns make reference to the number of shares that these buyers or sellers are posting to trade. One reads and states a quote by first reading the highest buying price followed by the lowest selling price. For example, our chart below emphasizes "Buying at Php 4.12 and Selling at Php 4.14" You can buy directly and immediately if you agree to Buy Up at the seller's best lowest asking price of Php 4.14. Your order size (or volume) will reflect a deduction in the Ask Size column. On the other hand, if you don't mind waiting and aiming to buy shares at a lower price, you can Post and line up in queue with the hope that a seller may choose to Sell Down to your desired price. Once an order is matched, it will be reflected in the Last 5 Trades box showing the details of the trade transaction. This is also known as the Last Trade or the current market price. 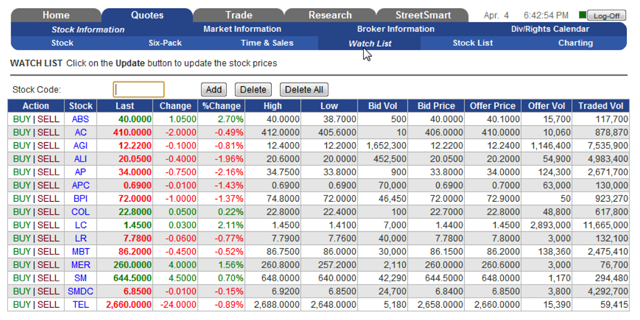 The PSE stock ticker shows a string of transactions or ticks of stocks currently being traded real-time. It serves to show which issues are active and what their current market prices are as well as to show details about the trade whether it is up, down or unchanged for the day. Learn to utilize COL Financial's research pages to keep you fully informed with your investments. You can check out what our experts think about stocks and look up pertinent Fundamental & Technical reports that show the financial statistics about companies in our coverage as well as their respective trend studies. You enter an order by filling out the order entry box with the stock code, number of shares you wish to buy or sell, and then the price you wish to trade. Thereafter please click on the Preview Order button to review and verify your order. Notice that a Buy order is highlighted in green and a Sell order is highlighted in red. The Preview window will display all the details of your proposed trade. It will show you a summary of what you entered and will outline the charges that will be incurred in executing this trade. You can Cancel or Modify orders that have been posted by clicking on the View/Modify Order under the Trade tab on the main menu bar. Click cancel to remove your order and modify to adjust the number of shares to a lower amount (the number of shares cannot be increased nor prices be directly changed to change a price, cancel an existing order and enter a new one). 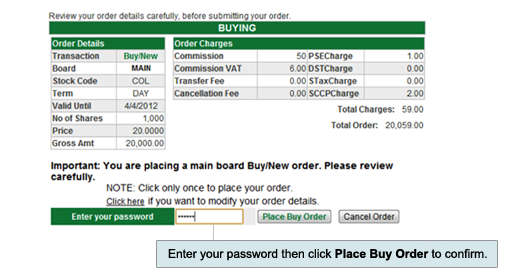 The PSE uses a minimum Board Lot or round lot system that specifies the minimum amount of shares one can buy or sell. 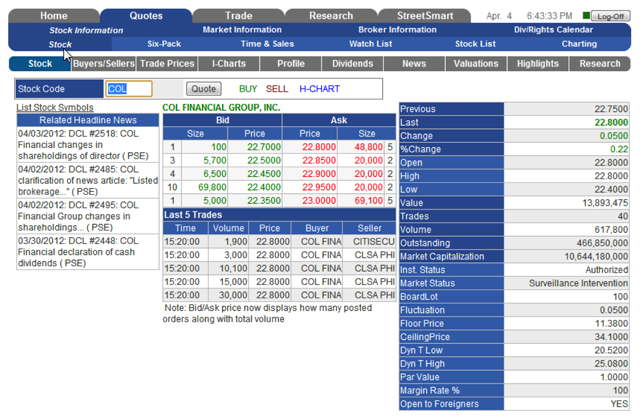 The minimum amount of shares will depend on the market price of the stock (see table). Ex. A market price of P3.00/share will allow you to buy/sell a minimum of 1,000 shares or in added increments of 1,000. Any order size below its Board Lot is known as an Odd Lot and can only be traded in the Odd Lot market. The Odd Lot Market may have different pricing schemes than the Main Market. The Price Fluctuation column shows the minimum increments of which a stock price can change. Ex. A stock price at P3.00 may accept orders to post up or down by increments of P0.01; at P12.00 it may move up or down by P0.02. There are many ways to keep track of the performance of your investments. You can monitor your stock positions through your Portfolio function, accessible under the Trade tab on the main menu bar. You will see your positions, market values, gain/loss figures as well as your cash balances and total equity. Access the Quotes page under the Quotes tab of the main menu bar to view the current market bid and ask prices and details of any listed company. You can also click on the prices or share allotments in the Bid / Ask columns if you wish to enter an order for the stock you are viewing. List out your favorite picks using our Watch List feature under the Quotes tab. 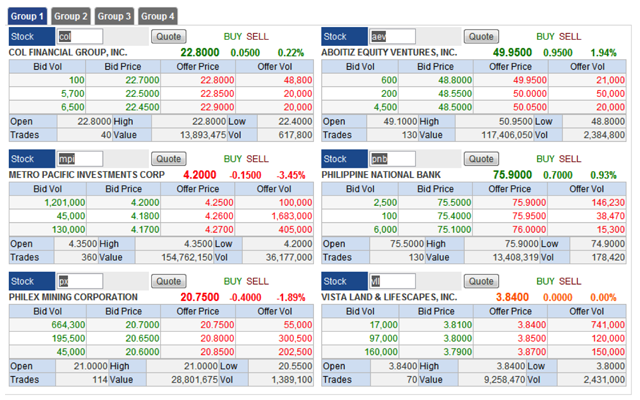 You can add, delete, trigger a buy or sell command, or click on a stock code to jump to the stock quote page. You can also change your preference in action upon clicking My Settings under the Home tab. Finally, access our Six-Pack option to get a more detailed expansion view of the stocks you wish to monitor closely.